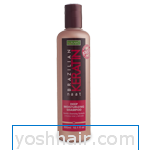 NAAT Brazilian Keratin Daily Care Shampoo(10.1 oz)Formulated with mild surfactants, Green Keratin and amino acids, all of which provide deep cleansing without being abrasive. Designed for daily use. Sodium chloride free. Everyday Moisture that Reduces Volume & Frizz NAAT Brazilian Keratin collection restores and intensifies your hair's nutritional balance, leaving it incredibly smooth, strong and flexible. Unlike typical animal-based keratins, our exclusive Green Keratin formula stays in your hair longer and is more resistant to rinsing. Promotes vibrancy and hydration, giving hair a natural, healthy shine.’ Benefits: Works with all hair types Repairs cuticle damage Regenerates and strengthens hair fibers Restores natural shine and softness Seals hair cuticles Reduces volume and frizz Makes hair resilient and healthy Formaldehyde and sodium chloride free Great for every day use. Also recommended for those who have professionally relaxed/straightened hair to keep hair at its best between touch-ups. Product contains Green Keratin: An active ingredient derived from soybean, corn and wheat proteins that deeply adheres to hair fibers, promoting incredibly smooth hair through heat action. The result is strong, highly nourished hair that improves flexibility and shine. Alle prijzen op onze site zijn inclusief 21% Btw. Mocht u willen afrekenen, dan komen er naast de verzendkosten dus geen extra kosten meer bij. GROOT INKOPEN VOOR UW ZAAK? Dit product is ook in te kopen tegen groothandelsprijzen. Vraag naar de voorwaarden. Wilt u kopen tegen groothandelsprijzen stuur dan uw Kvk-nummer, Btw-nummer en adresgevens naar ons toe: yosh@yoshhair.com Indien een product niet op voorraad is, houdt rekening met een levertijd van 6-8 werkdagen. Wij nemen in dit geval binnen 48 uur contact met uw op.